Diego Rivera (December 8, 1886 – November 24, 1957) is one of Mexico's most famous artists. He is known for his large frescoes paintings depicting human progress the effects of technology on society. He was the husband of artist Frida Kahlo. Rivera was looking for a new form of painting to reach a large audience.it was in Europe that he found this new medium. He studied the Renaissance frescoes of Italy that he found the fresco. Frescoes are large mural paintings painted on fresh plaster. As Rivera wanted to reach masses of people the fresco was the perfect medium for him. 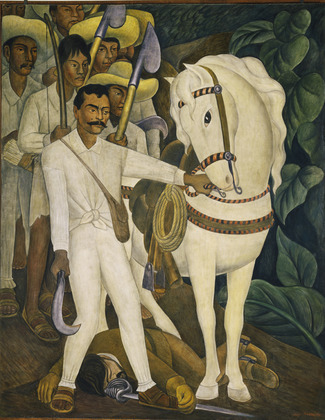 He painted his murals on public buildings whereby he was able to introduce his work to the everyday worker in Mexico. 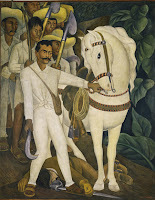 Rivera was also a Marxist and he saw his murals as a rebellion against the elite galleries and museums. 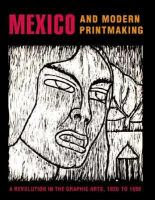 For Rivera working class spent most of their lives being a downtrodden by war and industry to bring progress to Mexico. Rivera did many murals for American buildings, two for American Stock Exchange Luncheon Club and for the California School of Fine Arts. These commissions and in other American commissions to follow he would depict the lives of the working class. One of his most famous works done in American was done at the request of Henry Ford for the walls of the Detroit Institute of Arts. He also was one of many artists who worked through the WPA. This exhibit at MoMA will show mural panels and full-scale drawings and Designs for a mural he did for Rockefeller Center. The exhibit focuses primarily on the work Rivera did during his stay in New York in the early 1930s.